Can Tom Brady get past the Ravens? The Ravens and Patriots seem to match up real well. Two years ago they met in the AFC Championship game and the Ravens won the right to go to the Super Bowl. A year before that, the Patriots won and went to the Super Bowl. This is in my opinion a very even matchup. Joe Flacco has found himself in the playoffs and continues to excel. The biggest concern for the Ravens is whether or not their offense can sustain and hold off Tom Brady from getting on the field. Brady is playing extremely well despite not having the best supporting cast once again. However, he’s made the best of the situation and unlike last year, Rob Gronkowski is healthy and leading this offense. The team’s biggest factor is the running game. The rotation of running backs has helped keep them healthy and the return of Legarrette Blount is a huge addition to balance out the running game. I look at the Patriots secondary and they are extremely opportunistic. It may come down to which defense forces the turnover and gives the offense a turn at the ball. It’s going to be a great matchup. Ultimately this game comes to the quarterback and I just can’t put anything past Tom Brady. He’s too good and he’s in his element at home. The Patriots will return to the AFC Championship game. Seattle has won the last two meetings against Carolina. 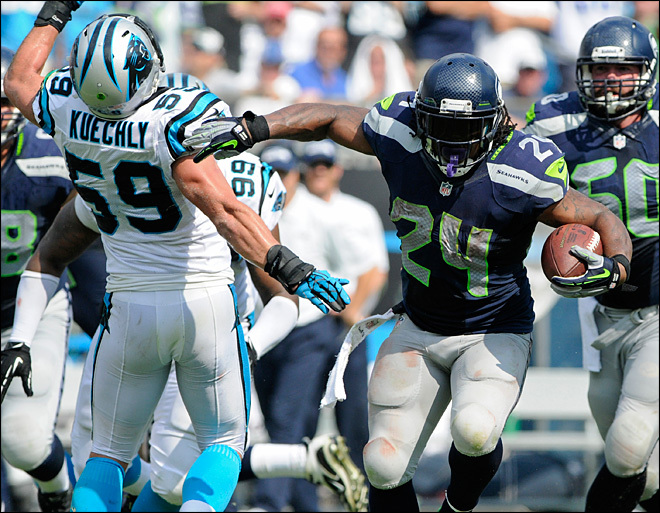 If you asked me a month ago who would win between the Panthers and Seahawks, I would not hesitate to say Seahawks. But now, both teams have changed. Carolina is on a big winning streak and despite their flaws on offense, are still a dynamic team that could make big plays. Their defense has kept the team afloat and a lot of it is credited to their linebackers for controlling the opposing running game. The two teams have met four times in the past five years and the Hawks have won all the games. But those recent games could have gone either way. This year’s meeting produced a defensive gem in a 13-9 game. Seattle’s offense has become way more polished and the balanced attack of Marshawn Lynch and Russell Wilson’s arm has given Seattle a huge edge as the top seed. I look for Earl Thomas to be the big factor in this game and shutting down the Panthers passing attack. With that shut down, I see the Seahawks cruising with the 12th Man to the next round. This entry was posted in Baltimore Ravens, Carolina Panthers, New England Patriots, NFL, Seattle Seahawks and tagged NFL Playoffs 2014. Bookmark the permalink.